I upgraded my kernel to 2.6.14-r2 and had problems with the Nvidia kernel/glx packages so I ran the latest Nvidia .RUN file from their web site and no Unreal tournament 2004 runs perfectly with no sound issues and great load times. I can not belive that a graphics driver upgrade could fix all this ... still I am not complaining. I will be reworking the topblock code to do with out the windowing toolkit GLUT, it seemed like a nice easy way to go but it is in fact over head I do not need and even makes the code unworkable as an xscreensaver hack. I have been investigating ASP.NET as no one of my employers has yet tried it and it seems to hold a lot of promise with all the objects and functionality people expected from earlier releases of ASP, like email and file uploading plus process monitoring. Ok here is the first topblock screen shot. 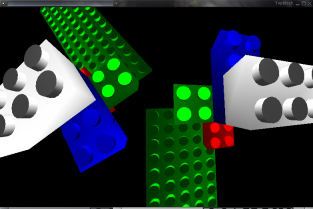 It shows the base board (green) that can be any size via parameters and four blocks with color and rotation parameters applied. (its actually two screen shots that I glued together. Just a quick note if you are using iTunes and it fails to recognize your iPod check that it is not detected as drive C:, I know it will not be very common bu thats the issue we had, set windows to always give the drive a drive letter of I: and it works fine. Yes that does mean that windows is not install on C: and apart from iTunes it has not been an issue. The lego block openGL project that was to be known as Linux block is now top block as it may get used on other non-Linux Unix systems. If you create two perfect cubes (like a computer would) and place them side by side because each wall has zero thickness the two cubes appear as one. This is something I have had to over come by forcing a small gap to appear between adjsent blocks. I have now got a linked list (never thought I would have need of one of those) holding the blocks position rotation and color and are then displayed each frame.screen shot soon. 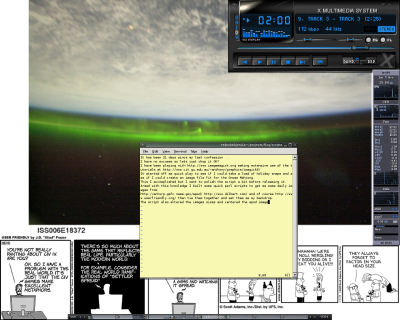 This release clears server dates and allows the double height comics of Sundays. In other news I considered getting the North-bridge attachment for my Reserator but I did not want to drain the system, so I opted for a £10 fan-less heat sink from Zalman http://www.tekheads.co.uk/s/product?product=602689 which was just a pop on pop off job and the motherboard is silent but very cool. Now the new machine is just as silent as the old machine was when I had the water cooling ! Ok time for my review of the second Dan Brown book I have read "digital fortress". First off this has the same Hollywood high speed ride failings of the Da Vinci Code but where the Da Vinci Code had great grounding in fact, Digital Fortress is built for entertainment and nothing else. Technical references go from amusing to ludicrous, a book is not all that engaging when you find yourself looking up and grinning to yourself at the ineptitude. But it is also easy to see these are added to for the story, the correct technical information would not have been so plot worthy. The visual firewall at the end was particularly entertaining. Enjoyable for the windows crowed but for anyone who has ever code and built there own firewall will be laughing in the isles. OK I am more happy with the desktop script here is the new release, adds sanity checking and a -s skip parameter to avoid downloading if all you want is the build process. Finished a book a short while ago it was Dan Drowns The Da Vinci Code, I had been avoiding this one but my father recommended it. First off, I could not put this down and almost missed my station twice because I could not close the book to get off the train, it really is that readable. But it is very Hollywood in the way the plot runs (and a film is already prepared for next year), this leaves the readers brain behind and takes you on a nice ride, easy reading if you will. In fact I would have to say without the (supposed) 100% accuracy of the historical events and references this might be teen fiction, but the main historical plot followed is fascinating and more so that it has been told so many times before but never hit mainstream, I shall say no more. I am just finishing another Dan Brown book Digital Fortress, stay tuned for my review tomorrow. I have an excuse and its a good one. It has taken me a week to get the parts ordered, installed and tested. It was a stock AMD64 CPU cooler that came with the system, but now I have a Zalman reserator, which is a huge external tower of a radiator/reservoir and comes with CPU and GFX cooler. Well I am impressed what with the quick release values and the silent running. So quite they include a flow indicator that bobs in the tubing to let you know the water is going round. The price was high but the results are very good CPU peaks at 35 deg C, anything below 70 is safe, below 60 is OK, below 50 good, below 40 very good, below 30 you live in an ice cube. The only bad thing is, and its not Zalmans fault is my system is still really noisy and it turns out it is my North bridge chip-set fan, north-bridge is motherboards mini CPU . Luckily the Reserator 1 Plus can handle cooling the CPU, GPU and the north bridge, I just do not want to take everything apart again ! oh, quick note about the desktop wallpaper setter, there are no checks to see if APOD image is an animated GIF and erm.. it makes a mess if it is, I might build in a check later. I am making up for lost time.. I like to use google to check amazon for books on blender as gentoo and debian have none. I like to usegoogleto checkamazonfor books onblenderasgentooanddebianhave none. Oh and gentoo has been letting me down slightly, I installed the unreal tournament 2004 demo and although it ran blisteringly fast the game was interrupted by short pauses when weapons were collected for the first time each map. This meant that for the first 2-3 mins the game was very jerky but after that is ran perfectly. I posted my problem on http://forums.gentoo.org/ and was advised to get the full game (lots of patches had been released since the demo). I bought it off amazon for five quid and installed it with a all the patches via gentoo portage system. I have no excuses so lets just drop it OK? It started off as quick play to see if I could take a load of holiday snaps and see if I could create an image file fit for the Gnome Mahjong. This I accomplished but I want to polish the script a bit before releasing it. http://antwrp.gsfc.nasa.gov/apod/ http://www.dilbert.com/ and of course http://www.userfriendly.org/ then tie them together and set them as my backdrop. The script also altered the images sizes and centered the apod image.